Some of the biggest stars in Hong Kong entertainment have gathered together this week for the 2017 Hong Kong International Film & TV Market, or FILMART, at the Hong Kong Convention and Exhibition Centre. The fair ends on Thursday, March 16. 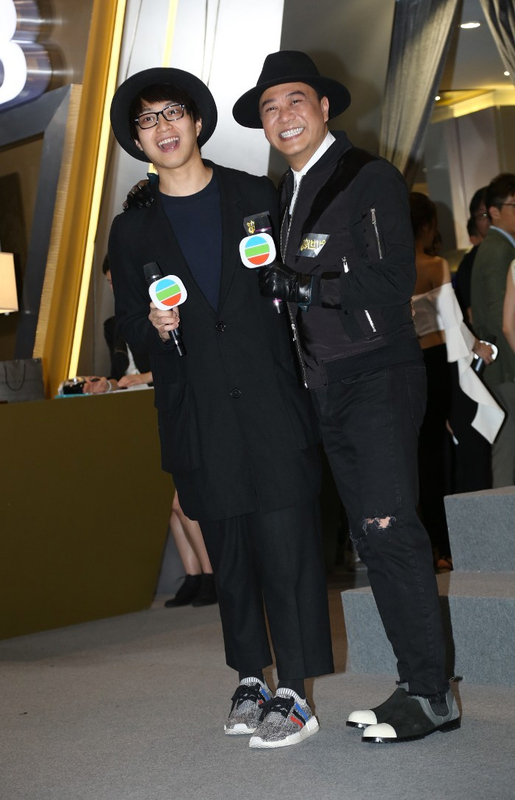 TVB was one of the biggest content producers at the fair, bringing over 70 artistes and introducing 16 upcoming television dramas to the media, seven of them being anniversary dramas for the network’s 50th anniversary. The first anniversary drama in the roster is Oh My Grad <老表，畢業喇！> starring Roger Kwok (郭晉安), Ada Choi (蔡少芬), and Wong Cho-lam (王祖藍), which is projected to air sometime in the early summer of 2017. Line Walker: The Prelude <使徒行者2>, prequel to the 2014 drama of the same name, may be next in line. The crime drama stars Michael Miu (苗僑偉), Moses Chan (陳豪), Jessica Hsuan (宣萱), Benjamin Yuen (袁偉豪), Pakho Chau (周柏豪), and Priscilla Wong (黃翠如). Due to their long filming periods, Dicky Cheung’s (張衛健) The Learning Curve of a Warlord <大帥哥> and the blockbuster Deep in the Realm of Conscience <宮心計2·深宮計> will be some of the last anniversary dramas to air this year. Productions for both dramas will not be completed until the late summer. “We’ll be going to Fujian to shoot the drama this summer,” said Dicky. “I’m not looking forward to that.” He laughed at his own misfortune at having to film most of his costume dramas in the heat, but added that some of his most successful dramas were shot during the summer. Bobby Au-yeung (歐陽震華), who headlines TVB’s other anniversary drama My Ages Apart <跨時代> with Moses Chan, joked about the incident where costar James Ng (吳業坤) had a visible bulge while accepting a music award on stage in 2015. Bobby said he has given James the nickname “Big Eagle” while Sammy Sum (森美) liked to call him “Burst”. My Ages Apart is produced at 50 episodes. It also stars Louis Cheung (張繼聰), Kristal Tin (田蕊妮), Ali Lee (李佳芯), Maggie Shiu (邵美琪), Elena Kong (江美儀), Hui Shiu-hung (許紹雄), Eddie Kwan (關禮傑), and John Chiang (姜大衛). Former couple Kenneth Ma (馬國明) and Nancy Wu (胡定欣) got along really well while the two promoted Deep in the Realm of Conscience, sister production to 2009’s Beyond the Realm of Conscience <宮心計>. Kenneth, however, did not interact much with his current rumored girlfriend Jacqueline Wong (黃心穎), who also stars in the show and attended the event. Jacqueline said she’s not jealous of Kenneth and Nancy, also expressing that she doesn’t mind working with Kenneth as a couple on-screen, regardless of their real-life relationship status. Like its predecessor, Deep in the Realm of Conscience is set in Tang Dynasty China, during the reign of Emperor Xuanzong, 100 years before Beyond. It stars Nancy Wu, Kenneth Ma, Steven Ma (馬浚偉), Annie Liu (劉心悠), Edwin Siu (蕭正楠), Chrissie Chau (周秀娜), Alice Chan (陳煒), Susan Tse (謝雪心), Candy Lo (羅霖), Angie Cheong (張慧儀), Akina Hong (康華), Pinky Cheung (張文慈), and Michelle Yim (米雪). Other anniversary dramas marked for 2017 includes Succession War <天命> starring Ruco Chan (陳展鵬) and Shaun Tam (譚俊彥); and Heart and Greed <溏心風暴3>, starring Michelle Yim, Ha Yu (夏雨), Bosco Wong (黃宗澤), Louise Lee (李司棋), Susanna Kwan (關菊英), Michael Tong (唐文龍), and veteran actress Nora Miao (苗可秀) in her first TVB drama. Too many sequels but most of the cast lineups look promising! Love Dicky! Still as sharp and as funny as ever! None of the series sound appealing to be honest. I think I would be interested in Dicky’s series if the cast wasn’t so weak and the story line didn’t sound so ‘been there, done that’. As much as I love Dicky, not sure that I have the patience to sit through everyone else’s scenes. As of right now, the only series from the line up I might consider watching is My Ages Apart, though not really fond of the female cast (except for Maggie), plus 50 episodes is way too long considering the poor quality of TVB’s series nowadays. That many anniversary series this year? I mean, I get that it’s the big 50th anniversary, plus it’s true that TVB is up against some tough competition from other stations the second half of the year, but not sure if cramming so many big productions in there all at once is really the best way to go. And I sure hope they are not rushing through filming just so they can get the series done in time for the anniversary timeslot because the quality will undoubtedly suffer even more than it already does now. The Line up sounds promising but, I think TVB should rethink the cast and lead actress paired for Dicky Cheung’s (張衛健) in The Learning Curve of a Warlord . Take it look at the other line ups and its cast… They seem reasonable within it’s level and respect. I almost feel like its a put down / slap in the face for Dicky vs the cast allocated to work with him. TVB its totally betting putting all the weight on Dicky. I’m also looking forward to see more returning like Kenix Kwok, Noel Leung, Michael Tao, Anne Heung, Kong Wah, Mirianne Chan, Jackie Lui, Leila Tong and Shirley Cheung. That has a weak crap cast…what a waste for Dicky….